The First Ongoing Tracking Study of the Opinions of Residents the 🇨🇦 & 🇺🇸 North “… DataPath Systems is a Yukon based market research company. We are recruiting Northerners to be part of our online panel. What this means is that every few months or so we will email a link to a short survey for you to complete. On some of the surveys there are prize draws you can enter. Being on our email panel means we won’t telephone you and interrupt your dinner. You can complete the surveys on your own time, when it is convenient for you. It also means that your opinions on Northern issues will be heard. As always, all the information you provide is completely confidential. Nunatsiaq News is the newspaper of record for the Eastern Arctic. Serving 45 communities and 70,000 readers a week with its website and print edition, Nunatsiaq News continues to grow its overall readership, web visits and advertising revenue. Its editorial team offers credible, in-depth and award-winning journalism which, together with a lively website comment section, draws readers from the North, southern Canada and around the world. Reporting to the Publisher, you would manage an experienced editorial team including a senior content editor, four reporters and a number of freelancers. You would plan, co-ordinate and administer posting multiple stories, including photos and videos, to the website each day as well as publishing a weekly print edition. You would continue to grow the newspaper by adding editorial resources to expand coverage, eventually moving from week-day postings to seven days a week. You are an excellent communicator, a skilled editor and writer, with meticulous attention to detail and deadlines. You are well versed and take initiative in a multi-channel environment of print, web and social media, engaging readers on many platforms while drawing increasing traffic to the website. And you are capable of managing a team at a distance, including all aspects of hiring, compensation, housing and transportation. This position is based in Ottawa or Iqaluit. Closing October 13, 2017. Nunatsiaq News offers competitive compensation, profit sharing, health benefits, and, if based in Nunavut, relocation, housing and travel assistance. 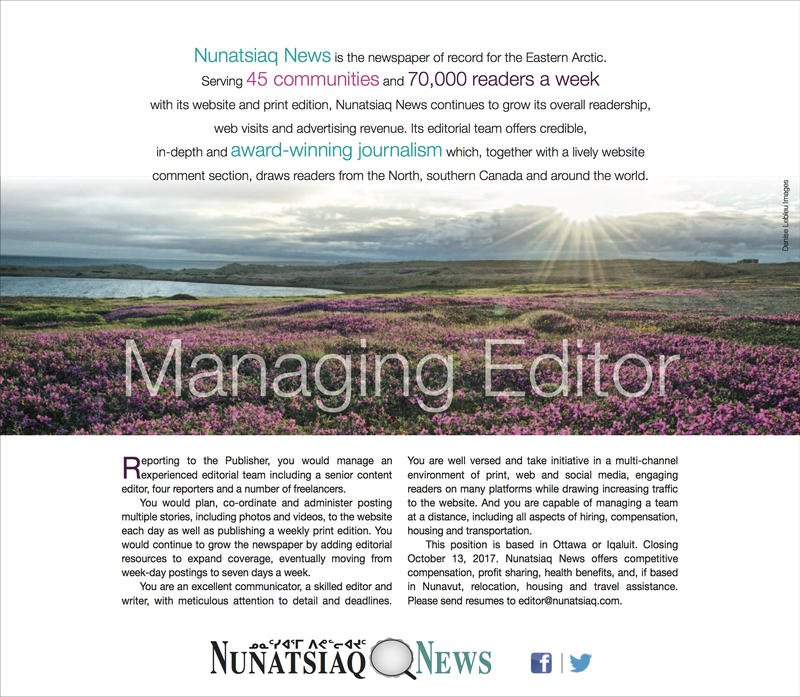 Please send resumes to editor@nunatsiaq.com. “… Digital return technologies offer Indigenous communities a means of repatriating objects and knowledge gathered from their ancestors as part of earlier colonial endeavors. Many third party institutions such as museums, universities, and government heritage agencies, retain possession of these collections because of the perceived impracticality of returning them to source communities. The concept of digital repatriation or “digital return” has emerged as a means of rebuilding relationships between source communities and third party institutions through the transfer of knowledge and objects in digital form. In this way, digital return systems, such as online archives, electronic atlases and digital databases, are excellent examples of disruptive technologies. The idea of disruptive technologies was first popularized by Clayton Christensen in his 1997 book “The Innovator’s Dilemma”. Disruptive technologies are technological innovations that upset networks supporting the existing state of affairs. Digital return acts as a disruptive technology because it disrupts established institutional models for archiving, accessing, and interpreting objects and cultural knowledge. Paradoxically, digital return also disrupts traditional Indigenous networks that support how objects and cultural knowledge are accessed and circulated by making them freely available on the public Internet . Resolving this paradox requires that we identify and address existing knowledge gaps in both the sociocultural and technological sides of digital return. A three-part scoping review of Indigenous digital return projects in regions of the North American and European Arctic was undertaken to: a) identify the extent and objectives of academic, government, and community-led digital return projects; b) characterize the digital return methodologies currently used in arctic communities; c) identify the issues and challenges facing digital return projects within the study area; and d) draw attention to heritage initiatives that are grass roots and community led. Thank you for participating in the Canadian Broadband Measurement Project. Unfortunately, your unit has not reported any data since 10-Dec-16, and we are wondering if the unit is still connected. To resolve the problem: Ensure your Whitebox is connected to your modem/router. Reboot the Whitebox by either switching the power off and on or briefly unplugging the device. Please send us an email to […] and we will confirm if the problem is fixed. We really do need your consistent support for the long term, so please switch your test box back on today. As part of the SamKnows panel, we give you access to your own data via an online reporting system, and also a monthly email report card to allow you to compare performance and communicate with your ISP. The Canadian Radio-television and Telecommunications Commission (CRTC) and SamKnows have established the ‘Measuring Broadband Canada’ program in order to provide Canadian citizens with reliable and accurate data concerning broadband provision across the country. Anyone who would like to be part of this project just needs to sign up. It might be worth reading the requirements before doing so just to make sure you’re eligible to join! On signing up, volunteers will receive a purpose-built broadband measurement unit, also known as a SamKnows Whitebox. The Whitebox is easy to install; once it has been plugged into the existing modem / router then it is good to go. Volunteers will also be able to see their own data from their broadband connection using a purpose-built SamKnows dashboard. “…What is the Broadband Measurement Project? In 2015, the CRTC launched a project to objectively measure broadband Internet performance, including actual connection speeds, in Canadian homes. It collaborated in this innovative project, a first for Canada, with major Canadian Internet service providers (ISPs) and SamKnows, a UK-based company that has built a global Internet measurement platform that spans five continents. The data, collected from approximately 5,000 Canadian volunteers, from across the country, will inform the CRTC’s future broadband policy-making. The data will also provide Canadians with a greater understanding of whether Internet services from participating ISPs are delivered at the advertised speeds and allow ISPs to improve their networks to better serve existing customers, and promote products to potential new customers. The key output of the project is the annual report, developed and reviewed by all participants. How is data collected for the Broadband Measurement Project? Ancestors – ᓯᕗᓪᓖᑦ Writing Competition For Nunavut Youth. Theme: Pre-colonization Inuit with a focus on *social organization, ᐃᓄᑐᖃᐃᑦ ᐃᓕᖁᓯᑐᖃᖏᑦ ᐊᑐᖅᖢᒋᑦ ᐃᓅᖃᑎᒋᓐᓂᖅ. Word Challenge: Use two traditional Inuktitut words on the verge of being lost. Goal: To better understand the traditional Inuit society and by extension its respect of life’s cycle. Preamble: My mother pointed out to me some years ago that there is a difference between learning and becoming educated ᐃᓕᑦᓯᓂᖅ and ᐃᓕᓐᓂᐊᕐᓂᖅ, this was a profound moment for me as it was then that I began to understand that Inuit have a long history of learning and teaching which also meant and means that we were a highly organized and functioning society with a high respect for life and capacity to learn. The theme in this writing competition then is “Traditional Society”, to find an area in the traditional social historical past and explain it in an essay or story format, this can be written in all Inuktitut or all English but be sure to include at least 2 traditional Inuktitut words that we do not hear in our current daily dialogue. W.C. Fields – The Diner Sketch – YouTube.